Your Grace is Sufficient: Do we really see? Do you remember last week’s gospel reading where you heard the story of the Samaritan Woman at the well? Very similarly, this week’s gospel passage is rich in symbolic imagery that points to the liturgy of baptism which the Elect will receive on the night of the Easter Vigil: Light and Darkness, Sight and Blindness, Enlightenment, Baptism. According to St Augustine, the blind man represents the human race wounded by original sin. Just like the blind man who could not be held responsible for his physical blindness, none of us can be personally faulted for the condition that has infected the whole human race. However, the story of original sin, is the flip side of the story of saving grace. By virtue of the sin of Adam, by virtue of the blindness which we suffer from original sin, God sent His only begotten Son to be our redeemer. Because of Adam’s sin, we are born “blind” but in the baptismal font we are illumined by the grace of Christ. This, is what we see in this story - Jesus performs a ritual much like the way we are baptised: He first anoints the man’s eyes and then tells him to wash in the Pool of Siloam. Anointing, washing, enlightenment–all these are “code words” for Baptism. So after undergoing this ritual, the blind man’s eyes are restored. But, he only sees partially. 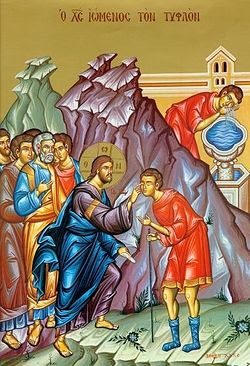 Having his physical sight restored, our protagonist is able to see Jesus, and yet, ‘he does not yet SEE our Lord’. Although he is able to see, he still has a long way to go to see Jesus fully, and face to face. He has a journey to make in order to do that. The same may be said of us. Baptism is not the end of our journey but the beginning! It renders us able to see; though we are still new born babes. We need to grow. We can see, but there is so much we haven’t yet seen. This is where the second half of the story makes sense. The man must grow in his faith to come to know who Jesus Really Is. Look at how his partial perception is described. For now, he merely understands Jesus as “the man called Jesus.” It is merely hear-say and impersonal. This surely describes a lot of modern Christians today. They know about Jesus but in truth, they do not know Him. Many Catholics in the pews are “sacramentalised but unevangelised,” and they remain ‘unconverted.' This is what some would call “pagans in the pews.” That is, they have received the sacraments, but have never really met Jesus Christ and do not know Him any more than in an intellectual way. He is little better to them than “the man called Jesus.” They’ve heard of Jesus, and even know some basic facts, but He still remains a distant figure in their lives. When asked questions about Jesus, they would respond just like this man, “I don’t know.” That’s why they become easy targets for Protestant proselytism. The text proceeds to show us the progress this formerly referred ‘blind man’ makes in coming to know and finally see Jesus. It is interesting that this progress comes largely through persecution. Being witnesses of the Light can be hard work. Just as the gospel story unfolds, the ‘enlightened’ followers of Christ must be prepared to face incredulity, persecution, and hardship for the sake of that faith. It is one thing to have Jesus light up our lives but it is quite another thing to live that life in the same light day to day, especially in the midst of a world consumed by the darkness of sin and unbelief. Having been denounced by his own parents, the formerly referred ‘blind man' is subjected to further and more intensive interrogation. This is not entirely a bad thing as we note that the continuing persecution seemed to make him grow even stronger and more able to withstand his opponents. Note his determination and fearlessness in the second interrogation he faces, which includes ridiculing him and placing him under oath. The result of this has further deepen his vision of Jesus. For, at first, he saw Him only as “the man called Jesus,” then he sees Him as a prophet, now he goes further and sees Him as “from God.” He’s progressing from sight to insight. His ability to see, given to him in baptism is now resulting in an even clearer vision. This then, leads us to the climax of this man’s journey. The final straw for him was when he was being thrown out of the synagogue, as many early Christians were. He has endured the hatred of the world, and the loss of many things. Instead of being broken and disillusioned, the man had remained resiliently steadfast. Now, cast aside, and hated by the world, the Lord approaches him. Now it is the Lord's turn to interrogate him, “Do you believe in the Son of Man?” “Sir,” the man replied, ‘tell me who He is so that I may believe in Him.’ The Lord replies, “You are looking at Him, He is speaking to you.” And finally, we have a confession of faith from a man whose physical, as well as spiritual eyes, have been fully restored, “Lord, I believe.’ And he stooped to worship the Lord. This final stage is the best of all. He actually sees Jesus and falls down to worship Him, Jesus is not only a prophet, He is not only from God, he IS God. Christ has fully enlightened this man. This is our journey, moving in stages to more perfectly know Jesus. It is a journey not only for the elect as they prepare for baptism but it is a journey that all of us must take for the rest of our lives. Some of you know Jesus in an impersonal way. Some think that he’s just a good man, a prophet equal to the likes of the Buddha, Muhammad or Confucius. The challenge would be to finally arrive at this personal confession of faith, “You are the Christ of God! You are my Lord and my God.” One day we will see Him face to face. But even before that time we are called to grow in faith by stages so that we can see Jesus for who He is. Remember the beautiful promise of St Paul in his letter to the Corinthians, “For now we see in a mirror dimly, but then face to face. Now I know in part; then I shall understand fully, even as I have been fully understood.” (1 Cor 13:12). For now, we must make this journey.